Trade union entities send a letter to the United States government that denied visas to Mexican rural militants who are invited to participate in the NAFTA Binational Conference on Labor Rights in Carson, California, December 2-3. The International Solidarity and Struggle Union Network further denounces this repressive practice of the Trump government against immigrants adds to this call for the release of the visas of these militants. Call on the U.S. State Department and on the U.S. Consulate in Tijuana, Mexico, to allow Mexican farmworker leaders to attend the Binational Conference on NAFTA in Carson, Calif.! Under pressure from the multinational Driscoll’s Corporation, the U.S. government has refused the right of Mexican farmworker organizers to come to the United States for a Binational Conference on NAFTA and Labor Rights in Carson, California on December 2-3, 2017. 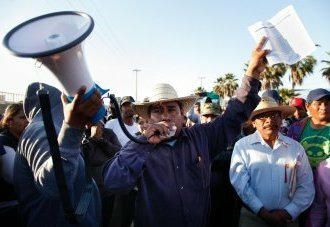 Three leaders of the Alianza de Organizaciones and of the newly formed Sindicato Nacional de Jornaleros Agrícolas (SINDJA) in San Quintin, Baja California, were denied visas to come to the conference. They are : Fidel Sánchez Gabriel, Octavio Angel López, and Juan Hernández. All had letters of invitation from the university department sponsoring the conference and from many of the unions and central AFL-CIO labor councils co-sponsoring the event. Driscoll’s — which is based in California — has been facing an international boycott of their products because of their refusal to recognize and sign a collective-bargaining agreement with SINDJA, the independent union supported overwhelmingly by the close to 80,000 farmworkers in the San Quintin valley. These workers and their families — a large percentage of whom are indigenous people expelled from their lands in Oaxaca on account of NAFTA’s destruction of Mexico’s agricultural sector — toil under near-slave-like conditions, with wages of $7 a day and a lack of healthcare and sanitation for themselves and their families. The Binational Conference to which the San Quintin workers were invited as keynote presenters has been sponsored by the California Faculty Association chapter at California State University at Dominguez Hills and by the following organizations : Hermandad Mexicana-La Original ; Sacramento Labor Council for Latin American Advancement (LCLAA, AFL-CIO) ; California State LCLAA ; Farm Labor Organizing Committee, (FLOC, AFL-CIO) ; Sacramento Labor Council (AFL-CIO) ; San Francisco Labor Council (AFL-CIO) ; Sindicato Mexicano de Electricistas (SME) ; Frente Auténtico del Trabajo (FAT) ; Sindicato Nacional de Telefonistas de la República Mexicana ; Comité Promotor Mexicano de la Conferencia Binacional (sede Tuxtla Gutierrez, Chiapas) ; Department of Modern Languages, CSU Dominguez Hills ; UAW Local 551 ; Labor Fightback Network ; OPT Tijuana ; The Organizer ; Worker Action Solidarity Network ; among others. Please get your union and organization to support the call for immediate action by the U.S. Consulate in Tijuana to provide the visas for these workers to attend the conference. There will be press conferences in Mexico and the United States to demand that they have the right to communicate with, and present their situation directly to, U.S. workers and activists.